Segments of Roxas Boulevard in Pasay and Manila are transformed every year to a virtual Christmas wonderland with vendors selling handmade Christmas trees of all colors and shapes. 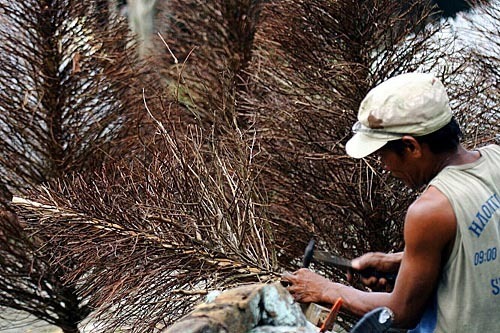 Mostly made of wooden twigs (from the ‘kulasi’ plant) painstakingly nailed and shape to form Christmas trees, Roxas Boulevard attracts flocks of shoppers looking for their ideal Christmas tree. White, pink and the classic green-colored trees are on offer, and haggling is de rigeur. Motorists on Roxas Boulevard are treated to the sight of these trees that signal the merry and hectic Pinoy Christmas season. Long live handmade Christmas trees! 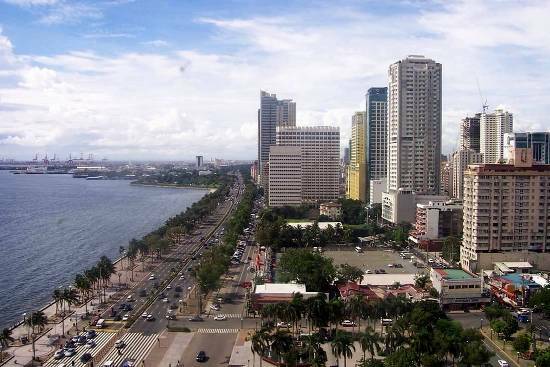 Roxas Boulevard, formerly known as Dewey Boulevard, was once an icon of tourism in Metro Manila until in recent years when it has fallen into hard times with the rapid development on the coastal strip along the cities of Pasay, Manila and Paranaque. An eight-lane arterial road that connects the centre of Manila with Pasay City, Parañaque and the province of Cavite the boulevard was named after former president Manuel Roxas. Coconut tree-lined with a wind-swept promenade on the Manila side, the boulevard is well-known for the famous Manila Bay sunsets. In the 1950s the boulevard was lined with high quality restaurants patronized by the Manila’s well-heeled society. During the Marcos regime the boulevard was often used for Imelda Marco’s endless cultural parades (the ended on Rizal Park) including epic (read: pompous) and costumed re-enacting of Philippine history on massive wheeled floats, the hysterical Papal visit parade to hordes of dancers that accompany international beauty pageant parades, complete with flag-waving schoolchildren lined up along the boulevard. Today, the boulevard has lost much of its shine due to the coastal reclamation project that pushed the Manila Bay shoreline further to the west of Manila, far from the boulevard. Seedy night clubs and motels have also replaced or crowded out the quality restaurants. Replacing the famous sunset views in Pasay are high-rise condominium towers and shopping mall complexes. Despite the creeping urban plight, Roxas Boulevard remains a favourite for Metro Manilans out for a leisurely stroll or those wishing to catch a glimpse of that famous sunset by the bay.